Assignment of space is on a “first come, first served” basis, with multiple booths taking precedence. Full payment must accompany request for space. Industry members of companies purchasing booths may attend annual conference without paying a registration fee. Only industry members registered with companies purchasing booths will be allowed on the exhibit floor. All other industry members must pay a registration fee equivalent to a booth fee to attend. There will be a $100 processing fee for refund requests for canceled booths submitted in writing by October 1, 2018. After October 1, 2018, MSNA will not make refunds for booth cancellations. Exhibit space will be available for set-up Friday, November 9, 2018. from 8:00 AM to 2:30 PM. Exhibitor load in and load out will be through the loading docks only. Exhibitor load in and load out is not allowed through the main entrance. Only hand-carried items may be brought in and out. All booths should be ready for Buyer’s time viewing by 2:30 PM on Friday, November 9, 2018. Booths are not to be dismantled until 11:30 AM on Saturday, November 10, 2018. A drawing for exhibitors for one free booth for the 2019 conference will be held after exhibits close. Exhibitor representative must be present to win. Requests for use of kitchen facilities must be made in advance. Arrangements have been made with NCC to use the NCC kitchen with freezer space, refrigerated space, and oven space. The kitchen is adjacent to the exhibit space. 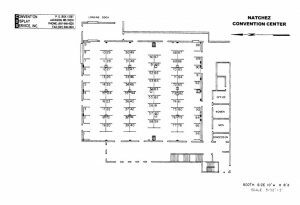 Exhibitors needing use of kitchen facilities should contact Doris Schneider at [email protected] or Rena’ Pritchard at [email protected] prior to October 14, 2018. Convention Display Services will provide for the distribution of electrical power from the available electrical system and at the exhibitor’s expense will provide temporary interconnecting cords and connections. Mississippi School Nutrition Association will post an Exhibitor Service Kit from Convention Display Services on their website. Exhibitors will complete the form and send it and payment to Convention Display Services. NCC will not go into the individual booths to empty trash cans or clean. NCC will provide large lined trash cans throughout the room and will empty trash cans during show hours. It shall be the responsibility of each exhibitor to maintain such insurance against injury to person or damage or loss of property in such amounts as the exhibitor shall deem adequate. Under no circumstances will the NCC accept or store deliveries of show equipment, displays, boxes or other merchandise from exhibitors. All such deliveries will be refused. All return shipments must be removed from the premises on Saturday, November 10, 2018. Convention Display Services will provide shipping instructions and rates for material handling services in the Exhibitor Service Kit to be posted. Carriers may make direct to site deliveries at the loading dock beginning at 8:00 AM on Friday, November 10, 2018. Convention Display Services will accept and deliver shipments to your booth. Rates for this service will be included in the Exhibitor Service Kit to be posted. Exhibitors are allowed to load-in and load-out their own vehicles at the dock.Exhibitors are advised to bring their own carts or dollies. Exhibitors will not be allowed to drive onto the show floor or remain parked at the dock any longer than required for load-in or load-out. No load-in or load-out through the main entrance except for hand carried items. No exceptions. Use of forklifts by exhibitors is prohibited. Forklift service is available only through Convention Display Services. Rates for this service will be included in the Exhibitor Service Kit to be posted.